Click here to go to the official site. The Deseret Morning News movie critic, Jeff Vice, says: "'Suits' tries hard but falls short... Unfortunately, the identity confusion concept isn't as funny as Henson apparently thought it was, and there are no big laughs to be had from this nonsense. In particular, the two missionary characters are unfunny, stereotyped caricatures--especially the way Weiss and Winer play them." Now I know why I'm not a paid movie critic: I thought it was funny. I liked it. Fortunately I sat in a Utah theater with three other SoCal "Gentile" transplants and we laughed at ourselves for laughing so much. We laughed because the 30 to 40 folks in the theater did NOT laugh. We laughed because we DID understand the stereotypes. We laughed when the 19-year-old elder admitted to his elder sidekick that his brother stole his girlfriend and married her. "Gee, and your parents approved?," replied the other 19-year-old elder. "Yes, oh yes. Mom and dad were happy; my brother was 42 and sharing my bedroom." That's funny. 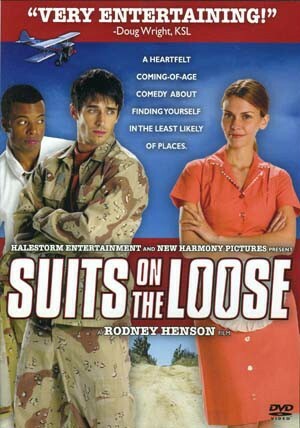 Is "Suits on the Loose" designed to reach the middle-class refugees of SoCal flooding into Zion? If so, this is great strategy. With the history of the LDS Church and their doctrine about blacks, I was a bit taken aback by this. But then the movie is all about marketing, at least that's my thought. OK, but before we go on... PLOT: Bad boy meets good girl. Good girl falls in love with bad boy. Bad boy changes to get good girl. Bad boy becomes good as he conforms to LDS doctrine. LDS moviemaker Richard Dutcher's sour grapes implies, "It's not the money!" Have you ever heard that one? Richard Dutcher's films, Brigham City and God's Army 2: States of Grace have been second rate earners compared to The Singles Ward and this genre of movie. This may explain Richard Dutcher's caustic remarks about LDS movies like Suits on the Loose: "an avalanche of mediocrity." Maybe, but I don't think this is what Suits on the Loose is about. I think it's a brilliant strategy of reaching out to refugees here from down under. I think it's a stroke of marketing genius. (Sidebar: you know it's interesting, when we lived in SoCal, Jews called us "Goy." Here the LDS call us "Gentiles." So I assume Jews here are called "Gentiles". Well, I don't think that matters with Suits on the Loose.) According to the official Suits on the Loose web site, Rodney Henson writes, "I wanted a film that would highlight the younger generation and wouldn't alienate any religion." Come one, come all, Goy and Gentiles! Join the Church; we need to grow, you know. Look, the four of us "Goy" or "Gentiles" fled SoCal because the place was just too, too, well, it was just too California. We along with thousands of other middle class types packed up and escaped up north to "Zion." Most of us SoCal "Gentiles" are ripe for the picking: generally we know nothing about historic Christianity and even less about the LDS than the well-mannered bicycle riders we see. So, I guess that in the long run Suits on the Loose is a great way to reach us; it's marketing. The humor aimed at oneself is the easiest way to "break the ice." Suits on the Loose is self-deprecating humor. For us "Gentiles," the target audience, it works. How can we "Gentiles," who've fled to "Zion," disparage a culture that can laugh at itself? If I did not know so much about the history and origins of the LDS Church and prophets, Suits on the Loose would cause me to jump to find out more about Mormonism. But, I do know a lot about the LDS prophets and history with blacks (e.g., Rob Sivulka, Racism in Mormonism). I'm not the average refugee from SoCal. Of course some Christians have displayed horrible behavior towards blacks, but Jesus our Savior and His Scriptures never did. When someone shows me the two Great Commandments in the Bible, and shows me that I have fallen short in loving my neighbor as myself, I'm chastened. I ask for forgiveness. I change my behavior. When things are put in print that disparage a people and I am told prophets speak ex cathedra, I get reflective. No; we don't have a temporary, mortal prophet to lead the Church today. But we do have an eternally living Savior. We look to Him and His Scriptures to tell us when we are wrong, and we change because He loved us first. We seek to please Him. But hey, disparaging remarks by The Deseret Morning News movie critic, Jeff Vice, and LDS filmmaker, Richard Dutcher aside, Suits on the Loose is funny. My wife and I are going to see it again this morning; she loved it. And if I were tasked in reaching the refugees of SoCal middle class flight to Zion, I'd follow the style and script of Rodney Henson, writer, producer, and director. Steve is CEO of Courageous Christians United--the pre-eminent experts in the U.S. on conducting safe and meaningful First Amendment educational outreaches in front of mosques and locales in California. We work to make Romans 10:13ff. possible under the First Amendment. Steve is a former Marine officer who came up through the ranks and in Viet Nam was a team leader and interpreter in the Marine's Combined Action Program which excelled in dismantling the masters of Cell Organization, the Viet Cong.